Following on yesterday’s review on this huge collection, part 2 is everything about lips. If you have not read part 1 on the collection’s eyeshadows and blushers, you can refer to my previous blog post. 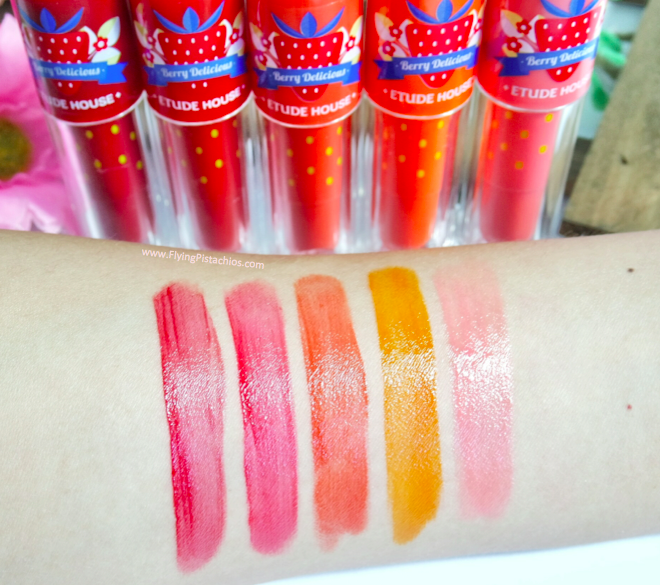 No introduction needed for this squeal worthy collection, let’s jump right into the review and swatches! #31 Green Lip Liquid actually warms up to a pink shade that changes according to your body temperature. 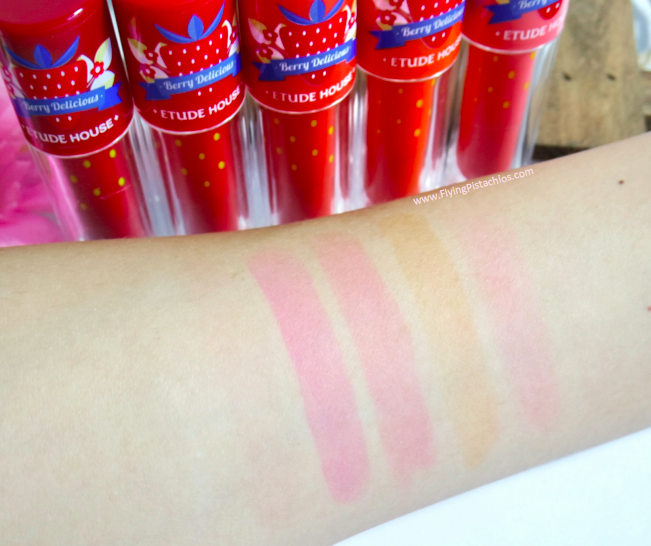 ETUDE HOUSE Berry Delicious Colour In Liquid Lips Juicy comes in 10 vibrant shades. My favs are #31, #32 and the intense #35 (great for creating ombre lips and if you have a darker natural lip colour). 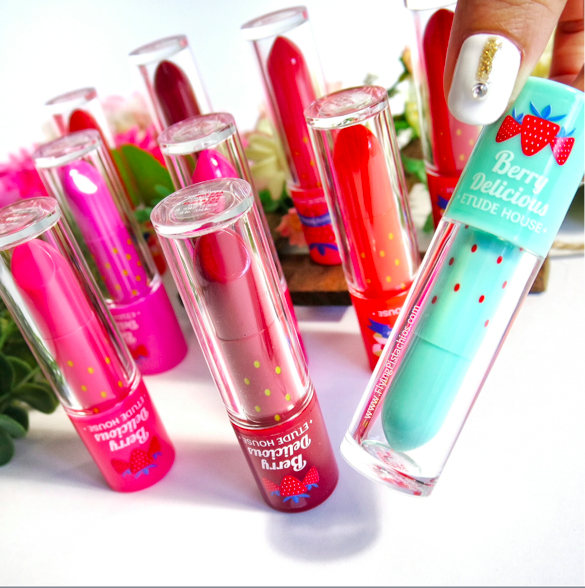 Just like the Berry Delicious Blushers, these lip liquids smell delightfully fruity. 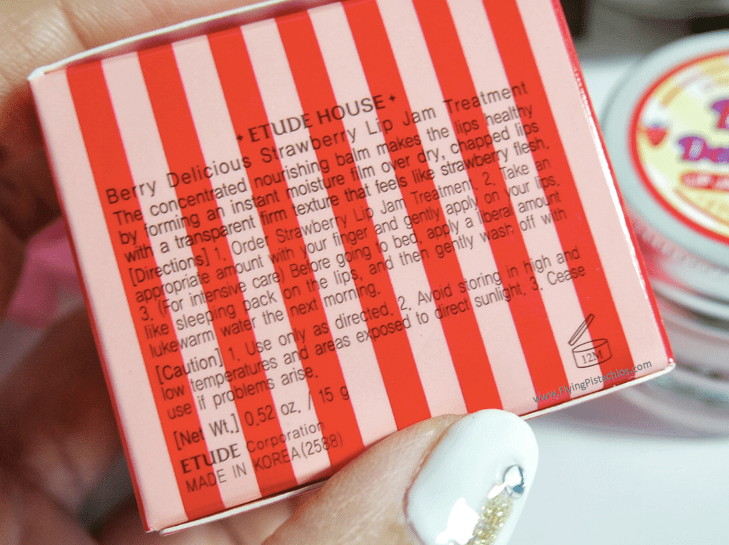 It’s no wonder since its formula contains strawberry and raspberry extracts, much self-restraint is required to stop myself from licking my lips! The texture is a combination of a lipstick and a lip tint and you can choose to dap on your lips for a light colour stain, swipe it on strong for a more intense colour or mix them to create a ombre lip effect. Creating the ombre effect is really easy as it’s liquid formula blends well together even without a brush or using your fingers. Just smack your lips together afew times to blend them out. 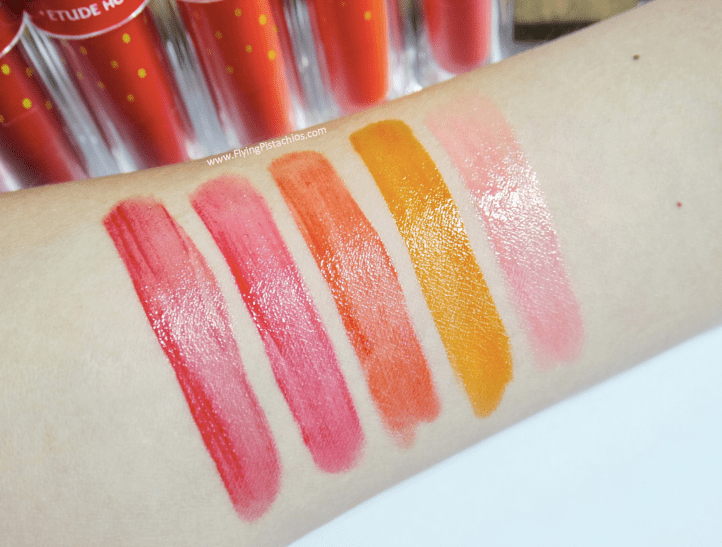 The lip liquids have a staining effect as seen in the picture directly above – some of the more intense colours stayed well on my skin even after washing with mild soap. 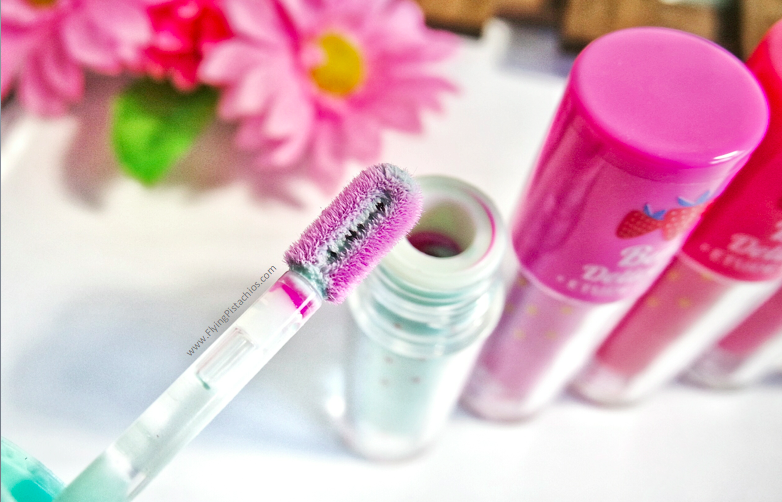 Definitely long-lasting, sweet and vivid. The most interesting colour must be #31 – a green lip liquid that changes to a shade of pink base on your lip temperature. Think of them like the fun mood lipsticks that changes colour according to your mood. but in actual fact, it changes due to the amount of moisture in your skin and your body temperature 🙂 If you are interested to find out how it works, click here to satisfy your inner geek. 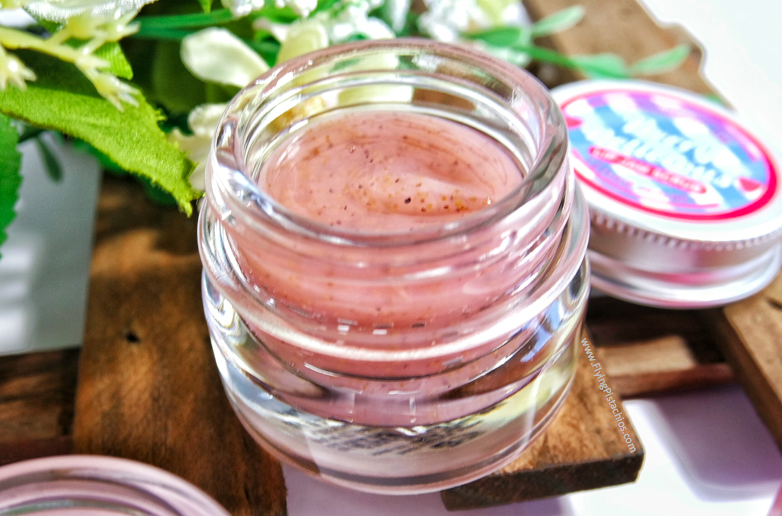 My lips were actually rescued with this Lip Jam Treatment! Such adorable and bright packaging! Highly moisturizing, leaves a slight oily surface which gets absorbed into the lips really quickly. Get moisturized, berry delicious lips overnight with the Berry Delicious Lip Jam Treatment – a sleeping pack for your lips containing concentrated nutrients including berry extracts, oils and vitamins. If you don’t like the idea of having your pillow cases smeared with lip treatment ( that gets into your hair and other parts of your face! ), you can also wear it like a lip balm throughout the day or keep it in your office and use it to protect your lips from the cold dry air-conditioned environment. I also like using lip masks on my elbows, heels and other super dry areas of my skin since they contain lots of good oils and vitamins and are stronger than the usual body lotions. Moist, bouncy, kissable lips? Checked! Your blog is so adorable c: Thanks for the review! Can’t wait to see the next part of the review ^_^ I’ve been thinking of purchasing the nail polishes from this line. I guess in different countries it is named differently! What?! A green lip liquid? That piqued my interest and I thought it will show a green colour on lips lol! Unfortunately no……Anyway this can be a cute gift to prank my friend on Christmas haha! 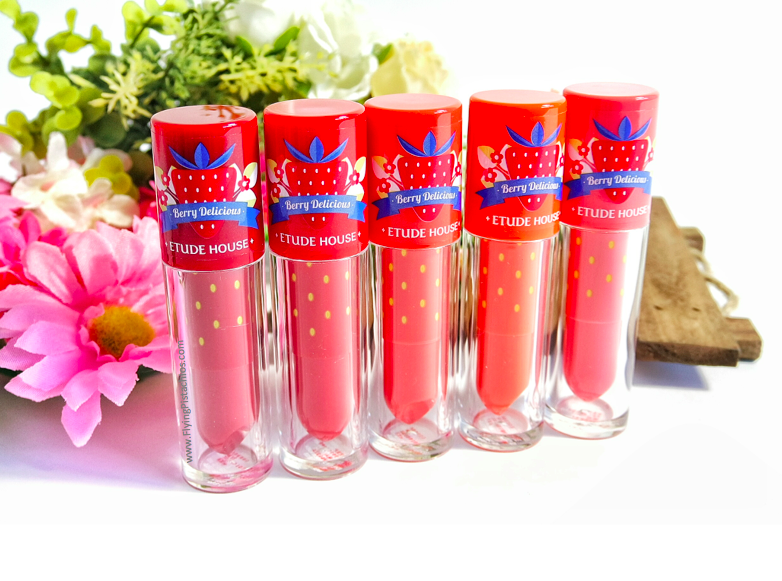 EtudeHouse now has a lot more and better lip products, you can check them out in store!